This is review No. 4 of 16 in the first round of our competition. Each review will compare four burritos, with my favorite advancing to Round 2. 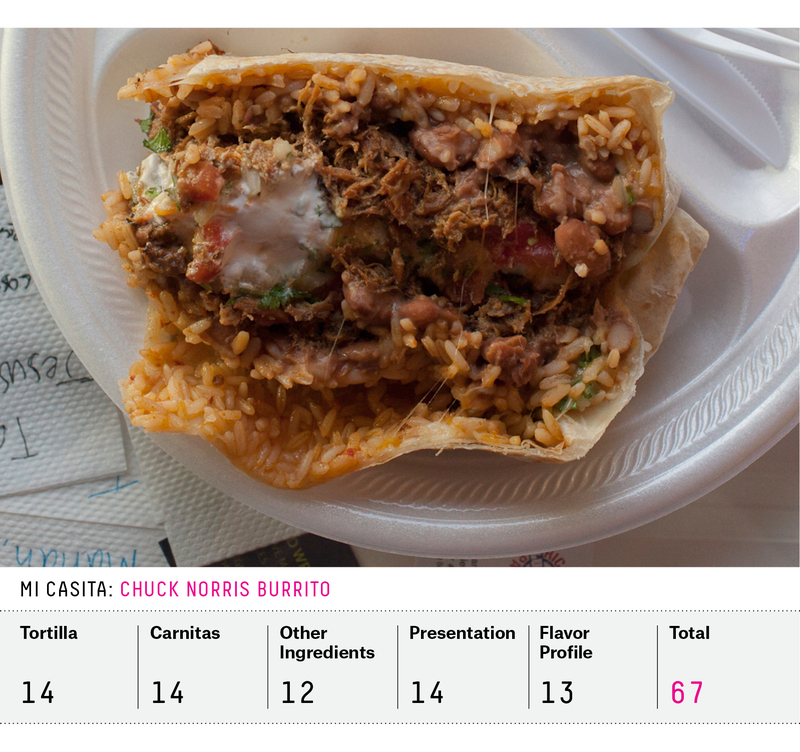 Today I visit the last of the Southern entrants to the Burrito Bracket, where I track an elusive, moving burrito and have a run-in with Chuck Norris that almost leads to my demise. 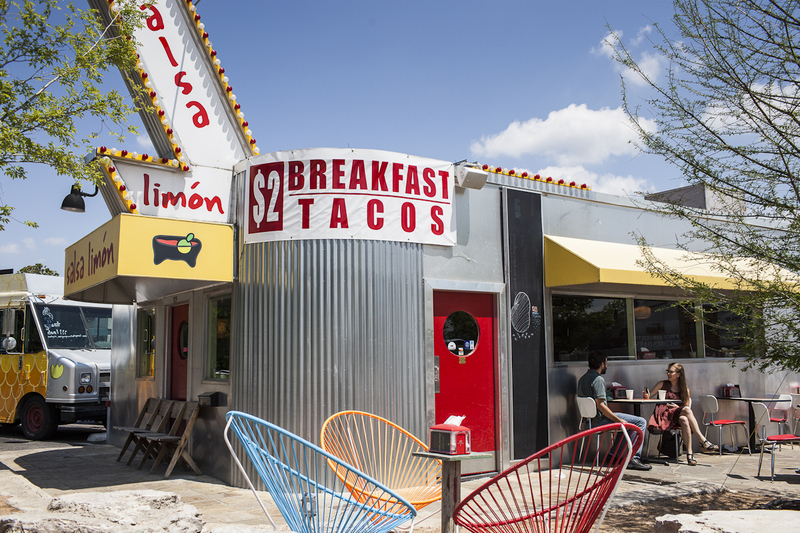 Mi Casita is housed in a small tan-and-red shack along a stretch of North Spur 63, a five-lane road dotted with Mexican restaurants. Its signature dish is the Chuck Norris Burrito, which comes with rice, cheese, pico de gallo, rice, pinto beans, sour cream, rice, guacamole, a choice of meat (I ordered carnitas on the recommendation of the man working the register) and rice. It comes in a whopping 14-inch tortilla from La Fama. My eating partner and I ordered just one, which took up the better part of two plates. 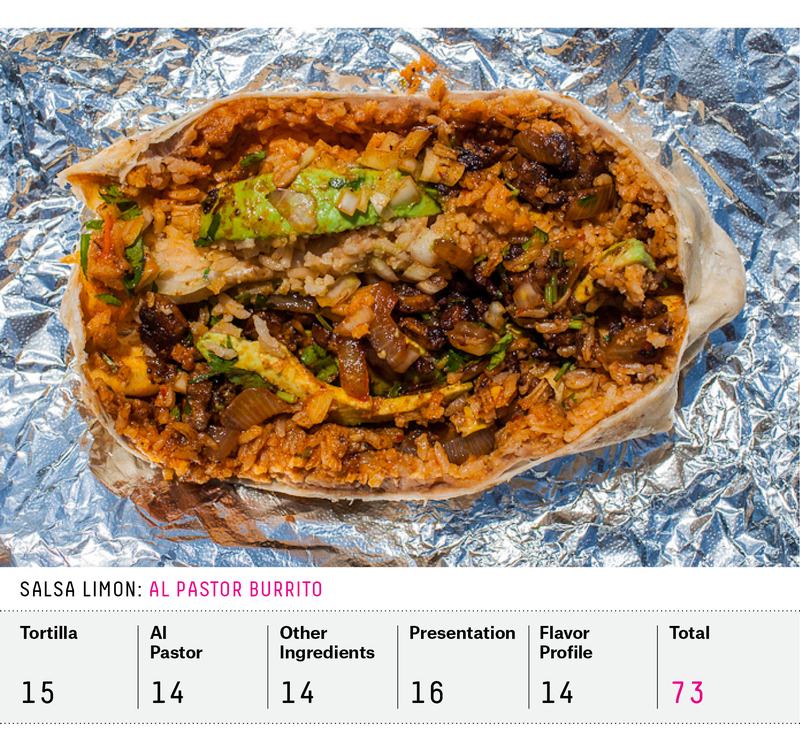 This burrito is a paradox wrapped in a tortilla: If you manage to eat the whole thing, then Chuck Norris loses, and we know that can never happen. But who wants to be served a meal she knows she can’t eat? The burrito’s size made it hard to decide whether it was a total success or failure on presentation. For what it’s worth, we didn’t finish it. It was hard to even pick this thing up, and the wells of the Styrofoam plate made it difficult to cut. But more important, the ingredients weren’t balanced; there wasn’t nearly enough meat to compensate for the vat of rice and beans. The tortilla was good, griddled until crisp on the outside. The cheese congealed to the tortilla as the burrito cooled, creating something that resembled a thick crust. The salsas were good — a pineapple habanero had real kick and just the right amount of sweetness, while the chipotle bore a deep smoky essence. The carnitas, in keeping with the other Southern burritos in the bracket, were flavorful and rich (despite their scarcity). They had a slightly odd sweetness, as did the onions and sour cream, making the overall flavor too far on the sweet end of spectrum for my personal taste. I was pretty beat up after my run-in with Chuck Norris (though obviously that was the fault of the ground rules, which require me to consume at least half of each burrito, and Chuck Norris could never be wrong). For the first time on the burrito trail, I wasn’t looking forward to my next meal. In fact, I sort of feared it. But I headed to Houston anyway, where I was supposed to have breakfast the next morning. After checking into the hotel, I went to the gym, came back to the room and curled into a ball. The next morning, still intimidated by the mere thought of food, I ventured out in search of the mysterious Breakfast Burritos Anonymous truck. I’d been tracking BBA on Twitter and learned that it often parks near Inversion Coffee. But I arrived at the destination and there was no truck in the lot. I went into the coffee shop to investigate. “They didn’t show up today. That happens sometimes,” I was told. Hmm. So I did what any food fanatic would do: I tweeted at them. I promptly received a reply that the truck would be back the next day. The burrito gods had taken mercy upon me. 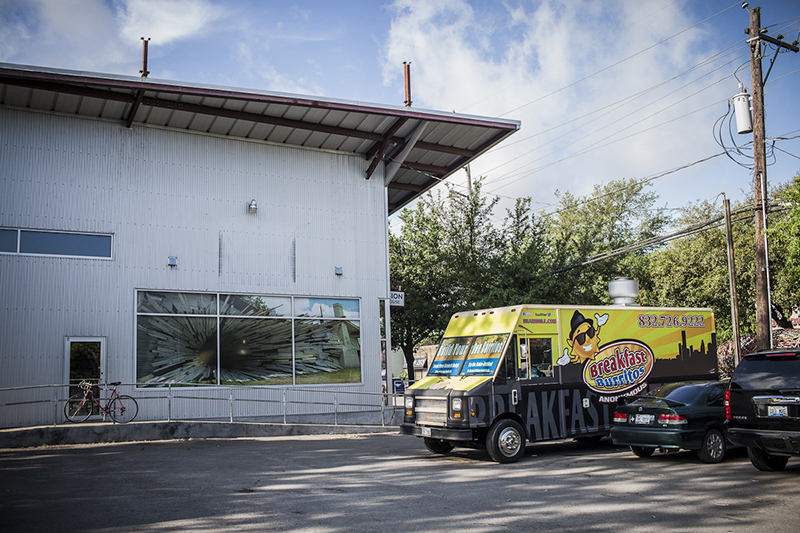 When I showed up at Inversion Coffee the next morning, eager and hungry, the black-and-yellow truck was parked right at the entrance. 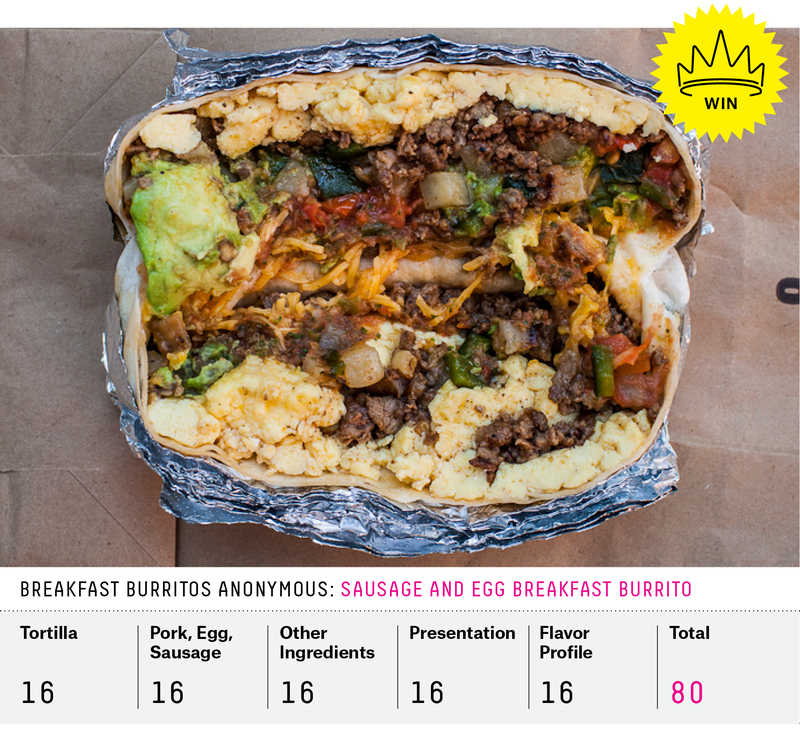 The breakfast burritos are expertly rolled and bundled up as perfect little packages. I ordered mine with pork sausage, potato, eggs, green chiles, cheddar, tomato, spinach, avocado and the signature Mama’s salsa. It sounds like more than a mouthful, but this burrito was a very manageable size; you could eat it and still make it into work afterward. The sausage was spicy, pungent, crumbly and perfectly in tune with the eggs and potato. I spotted the green chiles, but was never able to taste them. The spinach was unnecessary. This burrito was good to the last bite. When I paid, the young man behind the counter said, “Did you tweet at me yesterday? I told you I’d be here!” Chuck Norris doesn’t need Twitter (he’s already following you), but it turns out to be the best weapon to hunt down the BBA burrito. I had nobody to dine with at Salsa Limón, and I’d forgotten how hard it can be to eat alone. When you need to use the restroom, do you pack up your stuff and take it with you, leaving the wait staff to think you’ve abandoned your post? Or do you leave a few personal items behind and risk theft? I also find it impossible not to listen in on the conversations around me, which makes me feel like a jerk. The restaurant interior has two counter spaces, one providing a view of the kitchen action, the other a look at the outside world going by. Outside, a handful of tables are divided into two categories: in the shade and occupied, or beyond the shade and empty, victim to the Texas summer sun. I ordered an al pastor burrito and took my colorful plastic tray to the outside-facing counter. I looked down and couldn’t believe my eyes. The burrito was radiant and glistening with little droplets of juice. I picked it up, gave it a squeeze and watched as the liquid ran the long stretch of the burrito. Lime juice. For weeks, anything that normally would have included a slice of these green beauties (margaritas, tacos, beer) instead was accompanied by their smaller, tangier cousin, the Key Lime. I wasn’t feeling sorry for myself; lime farmers in Mexico are the real victims. Drug cartels took notice of a lime shortage brought on by a combination of flooding and bacteria in various Mexican states and started stealing the green gold, increasing already high prices. But here was a lime. Inside the burrito, the refried beans and Mexican rice worked seamlessly together, though they were a tad too salty. The meat was chewy, and while it was missing some of the tangy citrus flavor I like in a traditional al pastor, the chile flavor was rich and inviting. The avocado wasn’t ripe and the cilantro showed up only in body, not spirit, but surprise chunks of grilled potato, corn and carrots stepped in to round out the flavor of each bite. The tortilla was beautifully grilled, the burrito cut in half and dense. The salsa selection was fresh and exhaustive, with a full range of heat options available. 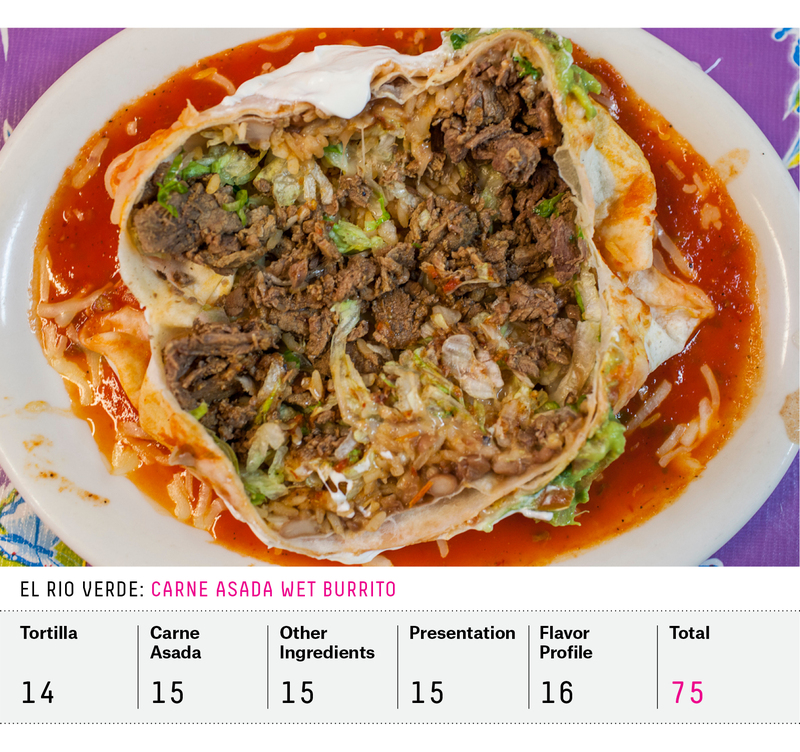 When the Burrito Selection Committee chose the 64 entrants in our Burrito Bracket, I abstained in the vote for El Rio Verde. It was listed as the “only wet burrito of note” in the South. Wet burritos, or smothered burritos, come covered in red chili sauce and shredded cheese and usually require a knife and fork. El Rio Verde’s distinction was intriguing, but I knew I had a bias so I felt I shouldn’t weigh in. The rest of the BSC voted it in without me, and I gave a silent fist pump. My bias is my family. My grandmother, aunt, uncle and cousins live in a small town not far from Tulsa, so I knew going to El Rio Verde would treat me to a big family reunion. And so it came to pass: I rolled into the place with a posse nine people deep, ages nine months to 84 years. None of my kinfolk had ever been to the restaurant, which is on the city’s north side, an area known for pervasive violent crime. But the only thing dangerous inside El Rio Verde is the size of its platters. The restaurant sits in a moat of shaggy fields, surrounded by warehouses, an abandoned building and a funeral parlor lined with razor wire. A mural of a fertile, colonial scene greets patrons in the parking lot. Inside it feels like a diner, complete with a lunch counter, booths and tables crammed into the space in between. 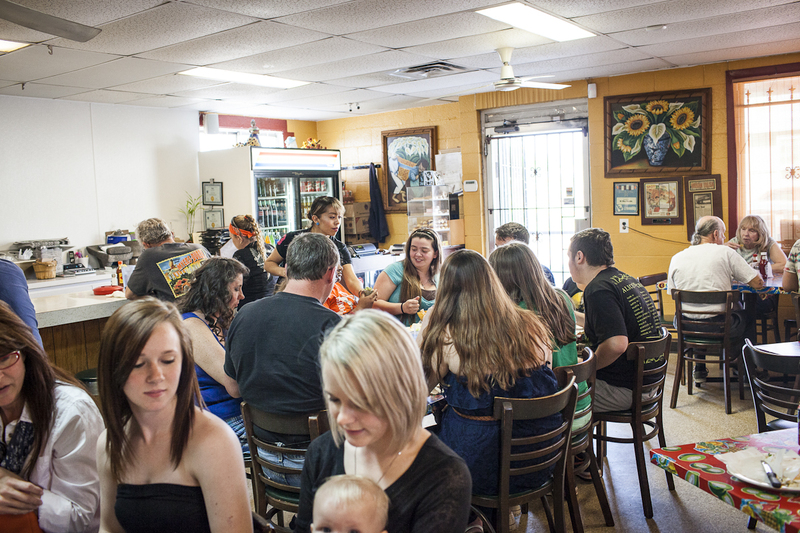 The menu proclaims “This is what put us on the map” just below the wet burrito’s listing. I opted for carne asada as the filling. Inside the tortilla I found pintos, rice, lettuce and carne asada. It wore just as many ingredients on the outside: cheese, sour cream, guacamole and a pool of salsa, which was thin and made of pureed tomato with a hefty amount of added heat. The tortilla was a little too thick, but fresh. The carne asada had a salty flavor that suggested a soy sauce marinade, but it was incredibly tender without any gristle. El Rio Verde also serves delicious jamaica, a drink made of hibiscus flower. 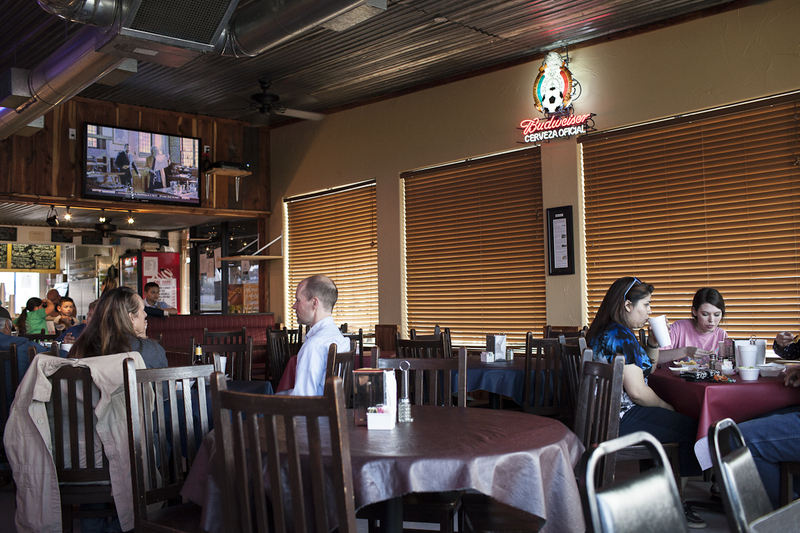 Nothing on the menu is over $7; the wet burrito, big enough to feed two, is $5.99. The total for the eight people in my party old enough to eat solid food was just $60. The last four Southern burritos all showed off their geographic proximity to the West, but the lone breakfast burrito ekes out a win.